Tis the season: the season of joy, family, celebration, and shopping! With the holidays nearing, families are trying to find the perfect present for their aging loved ones and for their caregivers. Most of us struggle to find the perfect gift for just about anyone, but when lifestyle needs change as we grow older, the right gift can seem even more elusive. Luckily, suggestions abound for great gifts to give your elderly loved ones. The Huffington Post suggests practical treats like this two-handled mug, which has extra-large handles and drip protection to make gripping and drinking easier for seniors who may be losing strength or find their hands to be shakier than they used to be. They also recommend the Magellan Smart GPS for its larger, easier to read screen; temperature regulating sheets from Hammacher Schlemmer ,which use a fabric developed for NASA to help keep seniors comfortable without the dangers of electric blankets; and the GTEC AirRAM vacuum cleaner which is cordless, tubeless, and weighs only 7.5 pounds. For a more personal touch, make a scrapbook with pictures of children and grandchildren, especially if they’re with grandma and grandpa. Such gifts give your aging loved ones a way to keep your family close to them even when you can’t physically be there. Also consider making a custom video with holiday greetings from the whole family, messages of love and appreciation, and your beautiful smiling faces which they’ll be able to watch over and over again. A tablet might be a great option, which you can pre-load with applications to help them manage medications, exercise their brains, keep track of appointments, play the music they love, and video chat so you can stay in touch face-to-face. Another great option is a health management or fitness gift certificate for a nutritionist or dietitian to help them maintain a healthy diet as they age, or a personal trainer who specializes in senior health to help them create a low-impact fitness plan to help them stay in shape as they age. 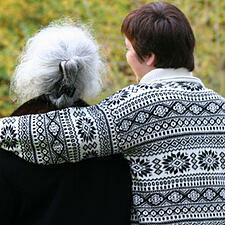 And, of course, you can give the gift of caregiving to make sure your loved one is safe and comfortable at home. It’s important not to forget the caregivers in your life as well! For these wonderful people who give their time and energy to your aging loved ones and become part of the family, consider giving them a way to relax and pamper themselves when they’re off work so they can feel recovered and refreshed on the job. These can be personal home spa items like a foot massage bath or shiatsu foot massager, or baskets of lotions and bath salts, or even better gift certificates to their favorite day spas and massage technicians for an afternoon of indulgence. Giving your caregivers a night out with their spouse or family is also a great way to say thank you for all they do for your family; purchase a movie gift card with enough to pay for a cinema outing for their whole family, or tickets to a play or concert they’ve mentioned they want to see. You can also purchase gift cards for a meal at a restaurant you love or that they’ve mentioned, to give them some special time with their husband or wife. Finally, consider giving small luxuries that they may not buy for themselves related to their passions or hobbies; a set of high-end spices for a caregiver who loves to cook, for example, or a skein of cashmere yarn for a knitter or crocheter. Giving something personal shows them you value them as a person, not just as a helper.